Join the Mountaineers camp staff for a weeklong stay at Baker Lodge. 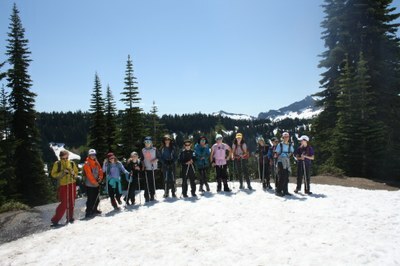 Join the Mountaineers for a 5 day adventure camp based out of Baker Lodge. This camp is open to kids ages 10 and up and includes transportation, food, and skills lessons up on the mountain. we will be the only folks staying at the lodge! Meet at 9 am at the Seattle program center to triple check our bags, pack the vehicles, play some team builders, and get on the road. We should arrive at the Lodge right in time for lunch! Once we are all feeling ready and settled we can start adventuring. Tuesday - Thursday will be filled with hiking and outdoor exploration, right out the front door of the lodge! Friday we will have our last breakfast together, pack up and hit the road. once we make it back to the program center we will sort all our gear and weather permitting go swimming or climbing. Pickup is at 3 pm on Friday. See you there!